Twitter launched Polls in October and they’ve brought plenty of great new engagement to the social media platform. While the addition has created new engagement opportunities, Twitter Polls have a number of limitations. One of these was that they only allowed 2 choices, answers A and B. Luckily, Twitter has already updated their polls and made them better. Just over a month after the initial release of public polls on Twitter, they’ve added the ability to have more than just 2 options. Twitter Polls can now include up to 4 responses, giving your followers more options to voice their opinions. Best ingredient for an amazing #Thanksgiving? No longer do your questions have to be limited to yes or no, this or that. Adding more options to Twitter Polls gives marketers more too. The addition of up to 4 options means giving followers more opportunity to express their opinions and more insight for your brand. Consider how multiple options may give users a better ability to choose the answer that expresses their feelings and how increased choice may get those that wouldn’t vote when limited to 2 choices, a little push to throw in their thoughts. While the addition of choice can be great, also be aware of how it could lessen response too. Do too many choices overwhelm those responding and make them less likely to share their opinions? Does it make it less clear to see both sides of the issue? Are your choices repetitive or are multiple answers pretty much the same? Could limiting your responses to just 2 make it easier for people to respond while still giving them choices that align with their opinions? Consider these questions when creating your polling options each time. Like any social message, marketers need to consider many things when composing Twitter Polls. It’s not as simple as drafting a tweet in second and then sending it off (or shouldn’t be if you want the best results possible). 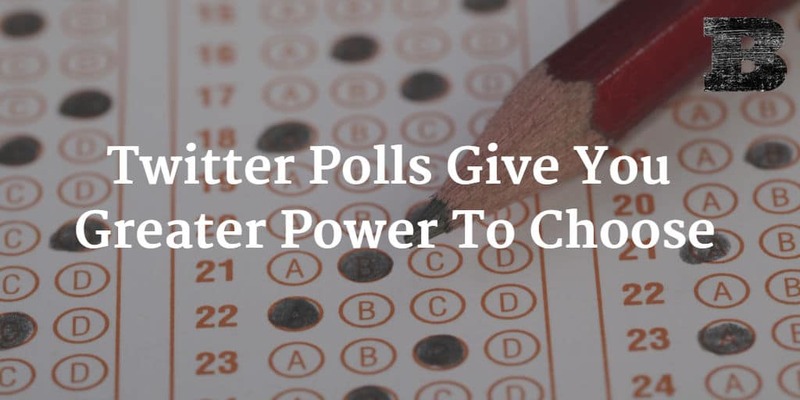 By putting some thought into crafting your Twitter Polls, you can see far greater response from your followers and give them polls they’re happy to be part of. The additional polling options make Twitter Polls more attractive than ever and add to our ability to gather insight and engage our audiences with ease. Consider these new options when creating your next poll and gather even greater engagement to the questions you ask of your following.